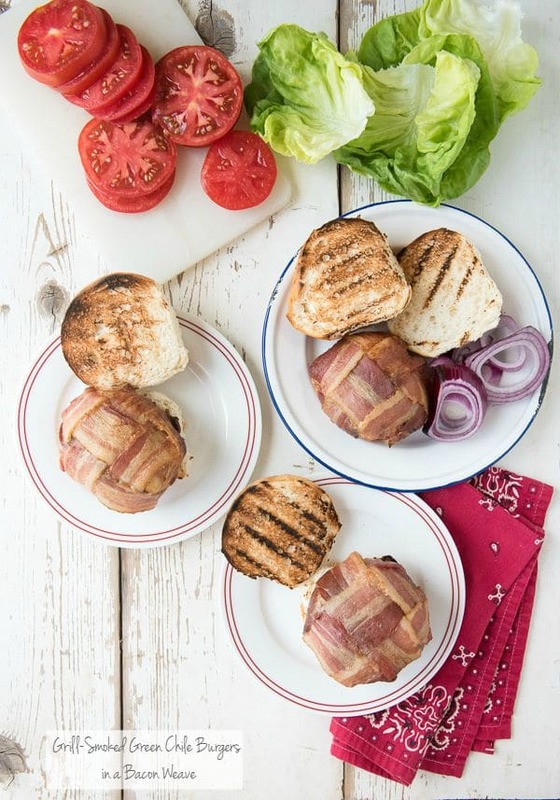 I have tried to practice great restraint regarding sharing bacon recipes over the past few weeks for fear readers will think I’m only grilling food wrapped in bacon this summer! I’ve been bursting at the seams to share this recipe however: Grill-Smoked Green Chile Burgers in a Bacon Weave. I’ve loved working with bacon on the grill and was reminded of that when taking Smoked Blue Cheese Stuffed Bacon-Wrapped Chile Peppers to a party last weekend. 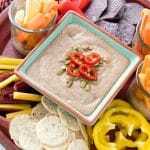 With only four ingredients and being easily smoked on a gas or charcoal grill, it is the quintessential summer appetizer to me. Mesquite-Smoked Jalapeno Cheese Bacon-Wrapped Hot Dogs are pretty darn delicious too! Be sure to use our Ultimate Burger Grill Guide for tips on how to grill the perfect burger! It was love at first sight for me with the bacon weave. We first met at Steven Raichlen’s BBQU in June when one was made to outfit a Toledo Torpedo or a ‘fatty’; polska kielbasa sausages wrapped with ground sausage and cheese and finally wrapped with a bacon weave, left to smoke to cook it through. The woven look of the pork lattice both captured my sense of aesthetics and adventuresome creativity with my grilling ideas. I knew it was something I needed to incorporate into my repertoire. 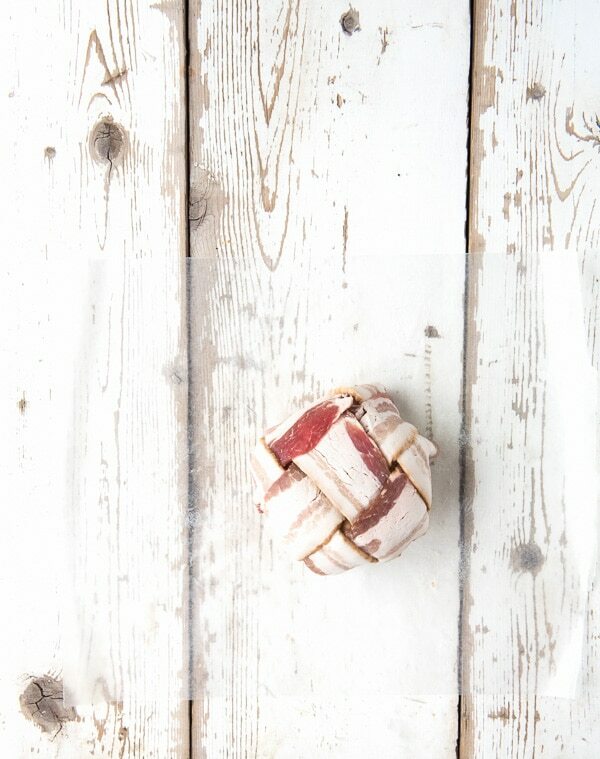 Bacon weaves can be used for many things; covering meat, laying on a turkey in the oven or grill or a small mat to add to a sandwich. They help keep the meat moist when used as a wrap. They are easy to make and I’ve created a step-by-step photo tutorial for your reference. 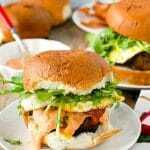 In the case of these Green Chile Burgers the bacon weave adds a depth of flavor that is irresistible. 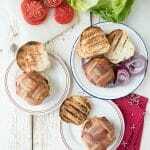 The wrapped burgers are cooked over indirect heat (meaning the grill is not on below them) and allowed to smoke to cook through imparting more flavor from the wood smoke. I should note that the method of adding smoke in the smoked recipes I’ve shared this summer does not require an official smoker. A simple piece of heavy foil with some wood chips placed over the lit side of the grill does the trick. As the wood chips smoke over the heat in the closed grill, the smoke flavor penetrates the food being cooked. Additional chips are added as needed during the grilling process and the result is an earthy, smoky layer of flavor. 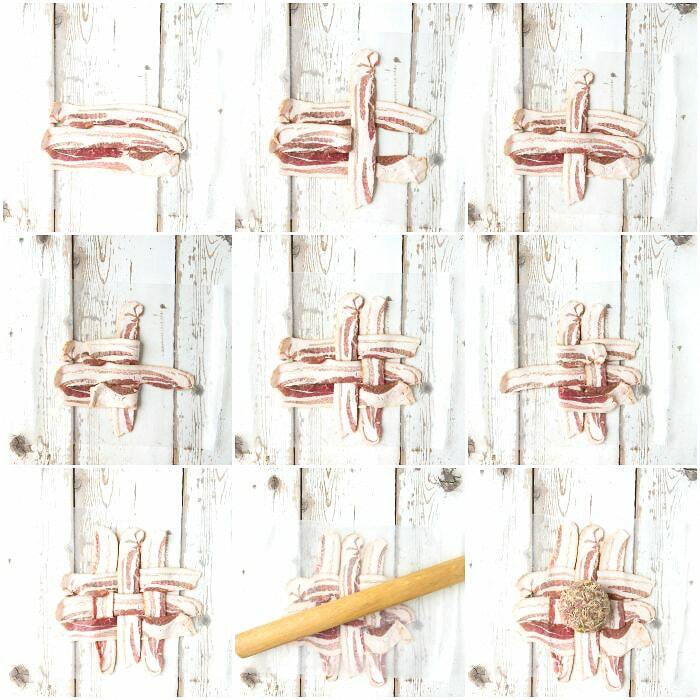 Everthing you need to know about a Bacon Weave (including step-by-step photos)! The burgers we are smoking today are a formidable size. 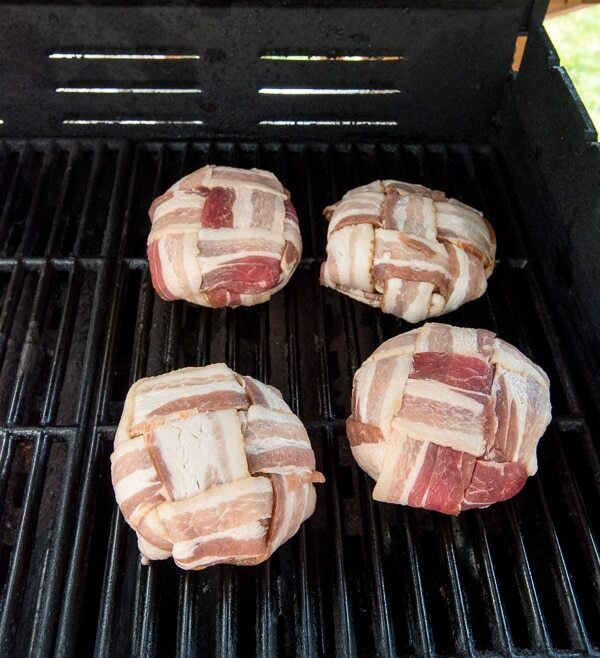 Third pound burgers covered with 6 pieces of bacon in the weave. Should you find that’s a bit too big, I have a trick for you. 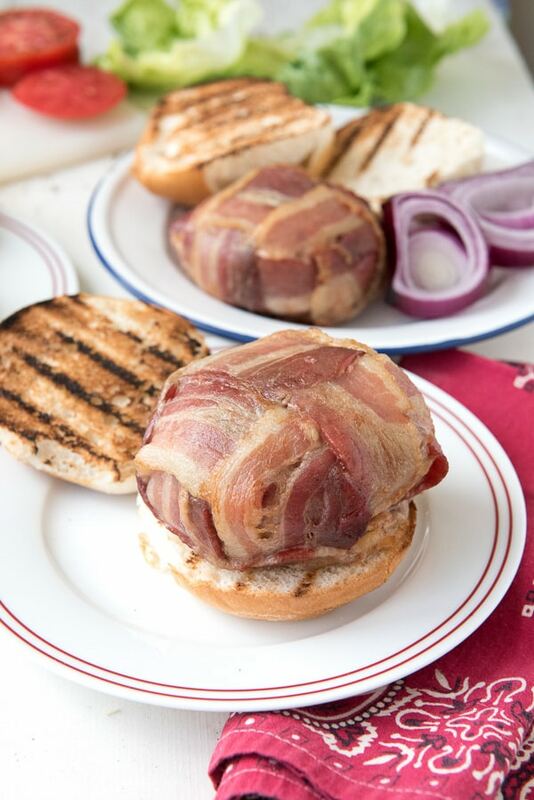 After the burgers are fully cooked and rested, slicing through the middle horizontally creates two burgers regular (still burger diameter) perfect for a bun but half the meat. 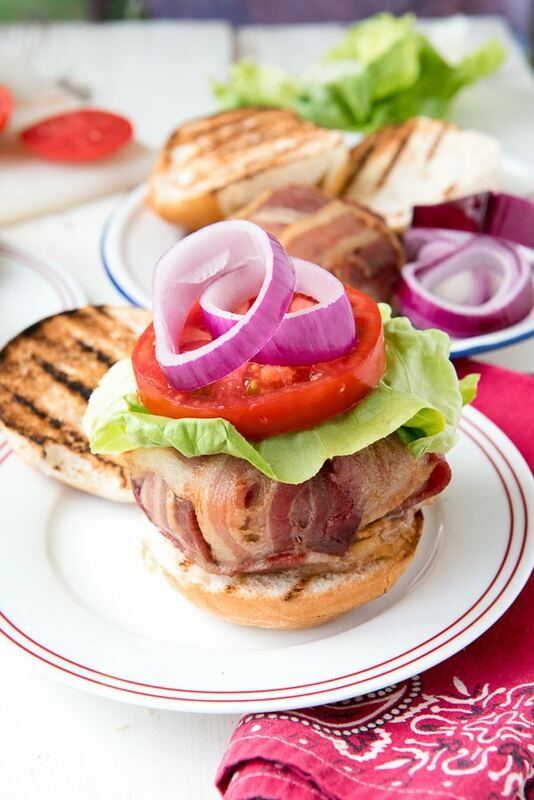 Add some fresh tomato slices and lettuce for a fresh BLT flavor! 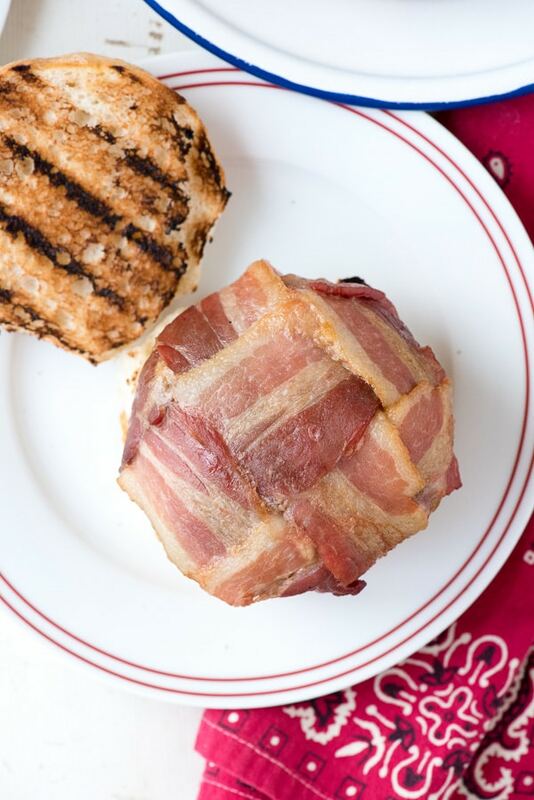 There is nothing more dazzling than a burger wrapped in a bacon weave. The green chile flavors in the burger itself make this a mouthwatering addition to any grilling session. Creating a bacon weave is very simple and will only take a few minutes once you have the hang of it. These burgers require no attention while they cook and should be pronounced done once an instant read thermometer registers the desired internal temperature (see the recipe details).As noted in the blog post, these are large burgers. Once they've rested off the grill, they can be cut in half horizontally with a sharp serrated knife to make burgers half the size if desired. Place the ground beef in a large mixing bowl and break it up with your hands. Add the green chilies, red onion and grated cheese. Mix well by kneading with your hands. Form 6 1/3-pound patties. Place on a plate or small baking sheet, cover and refrigerate. 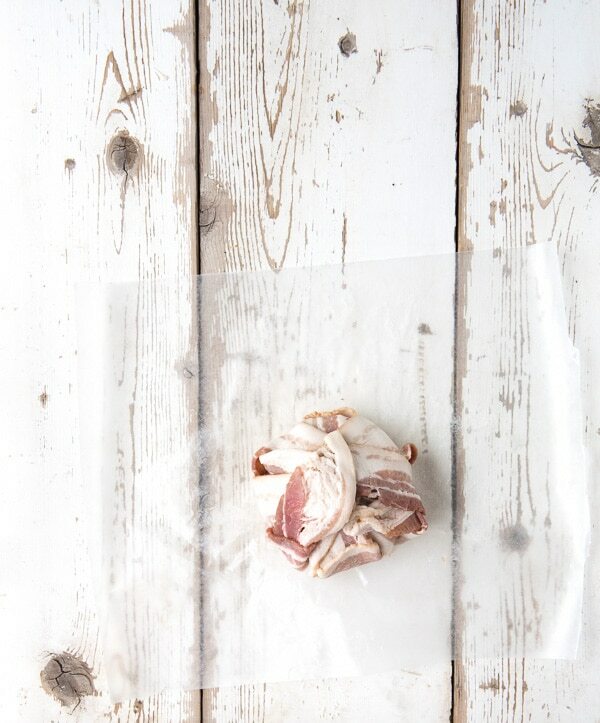 On a piece of wax paper, lay three strips of bacon horizontally with the long edges touching. Fold back the middle piece of bacon in half. Place a fourth strip of bacon vertically across the top bacon slice, middle gap and bottom bacon. Fold the middle piece of horizontal bacon back over the vertical piece of bacon. To the right of the vertical slice of bacon, fold the top and bottom slices of bacon back over the vertical slice of bacon. Place a fifth slice of bacon vertically over the top gap, middle bacon and bottom gap; fold the top and bottom horizontal bacon back over the fifth piece of bacon. On the left of the first vertical strip of bacon, fold the top and bottom pieces back over the vertical strip of bacon. Place the last vertical strip over the top gap, middle bacon and bottom gap and fold the horizontal strips of bacon back. Place one of the hamburgers in the middle of the bacon weave. Fold the ends of the bacon back over the burger to fully cover the back of the burger. Gently turn the burger over and place back on the plate or pan, cover and refrigerate at least 30 minutes before grilling. Repeat with the remaining burgers and bacon. Prepare a gas or charcoal grill for INDIRECT grilling (the heat is to the side of the food). Place a drip pan, disposable foil pan or sheet of foil with edges crimped upward underneath the cooking grate to catch fat rendering from the burgers. Heat to 350 degrees. When at temperature, clean and oil the grill. Place a smoker box or piece of heavy foil over the heated side of the grill and add a handful of mesquite wood chips. Gently add the burgers to the unheated side of the grill, with the lattice side up and close the lid. Cook until the internal temperature of the burgers reaches 155 degrees for medium (the temperature will increase to 160 degrees while they rest off the grill); about 45-60 minutes. Remove and allow to sit for 5-10 minutes before serving. Excess rendered fat on the bacon may be dabbed with a paper towel if desired. That looks so delicious! I’m positively drooling. A 60 minute grill time? Hot damn – these totally look like they’re worth the wait. Such a fun and fabulous recipe — we say, if you’re feeling bacon, go for it! Since they are smoked indirectly and are a third pound each with bacon it does take longer to cook but you do t have to do anything with them. Worth the wait! Pretty sure that bacon weave would excite my family We’ve got some bacon lovin’ folks over here. You know you had me at BACON right? I seriously need to get on this recipe this weekend because I truly need all this meat goodness in my life right NOW! YUM! This is a fantastic idea. It looks so delicious. I am going to try this for my BBQ this weekend. Oh my gawd, these look amazing! One thing you should mention to your readers is to use the best quality bacon they can find. The cheap stuff – even center cut – will shrink up. It’s best to spend a few bucks more for the best results. I’m so glad you think so Amanda. It is impressive looking, isn’t it? But really is so easy when you know how to make it. That bacon weave looks so complicated, but you made it look easy. I’ll bet those burgers are delish! That looks delicious! Maybe I will surprise my husband and make it for dinner this week! I love Bacon! Oh my word Toni! I just want to come and sit near your grill. It’s putting out the most amazing sounding things! I could definitely use some lessons from you. If you were you’d find yourself smelling of smoke and bacon most of this summer Chris! Could be worse, right?! Yum. Now THIS is a burger. I would love to try. I would probably feel it after (gallbladder issues) but oh boy would this be SO worth it! Now that just looks fantastic. My hubby would be a fan of that. That sounds delicious. We’re kosher, so I wonder if I can make this with turkey bacon. I don’t see why not. If you use the burger’s internal temperature to measure doneness I think the turkey bacon would cook fine and won’t over cook since it’s not over a flame. Let me know if you do it, would you? Oh my gosh! 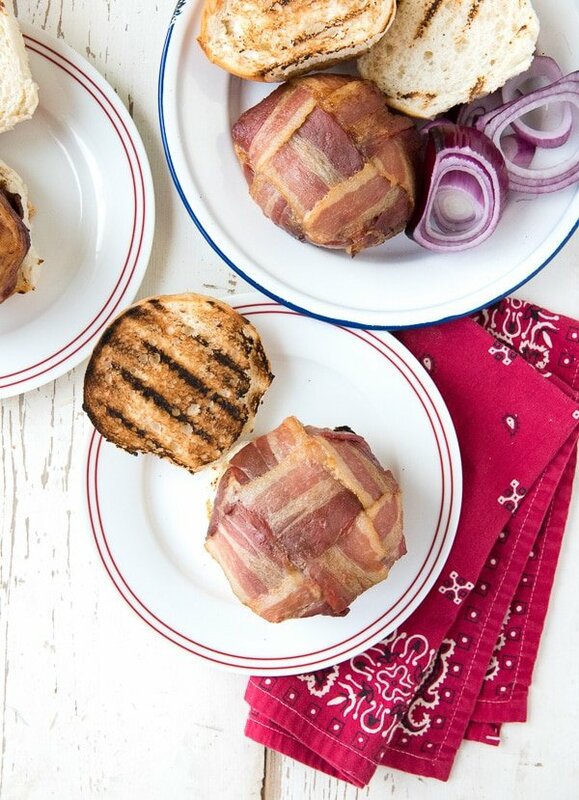 Those bacon burgers look so good! I’ve got to try these sometime. 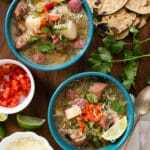 I have often said there is nothing that can’t be improved by the addition of a little green chili. Or a lot, depending. And the bacon! We have you to thank for our new addiction to cooking bacon on the grill, and now this…more thanks coming your way! You are a master at describing how to assemble and recreate recipes. Beautiful photography…as usual! Great idea on how to reduce the size of the burger. Thanks again! Nancy I’m so sorry about my tardy response! I’m always delighted to read your comments and thank you for your time in leaving them. Bacon on the grill is great, isn’t it? So many possibilities (one more coming your way next week; this time a collaboration with a teen with a great palate). The bacon weave looks so exotic but really is so easy (shhh…..no one needs to know). Glad the photos helped out. Certain things are best explained with pictures along with words. Wow – I can’t imagine how wonderful this burger must taste. It is a thing of beauty! 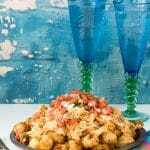 You are the grill master with wonderful creative recipes. Gorgeous photos too!